Installing retaining walls has been on the up and up in the Denver metropolitan area, and for good reason. Previously only installed for practical reasons, retaining walls are now being used to create beautiful patios as well. Retaining walls are also used to take a slope or hill in your yard and transform it into a beautiful, eye-catching design. While retaining walls might be a new concept for some, they don’t have to be any longer. Here are the benefits of installing retaining walls into your Denver landscaping company! First and foremost, retaining walls are practical and essential for preventing erosion. In the Denver area, a lot of property has steep areas, with hills and valleys, where soil is easily lost. Avoiding erosion is crucial for your yard as if you forgo preventing it, you’ll cause expensive damages to your property that will last years on end. By installing a retaining wall, your land will stay where you want it, as the wall will fight against the land’s movement. These walls are a definite investment in stopping erosion and preventing an eroding slope in your yard. If your yard does contain a lot of hills or slopes, retaining walls can actually create more space for lounging or playing around in the yard. You can accent the walls with signage and plants or flowers. Retaining walls also allow you to be create and really jazz up your landscaping. They allow your yard to make a fantastic first impression, and make a grand entrance upon your neighbors. Not sure what plants would look great? Read up on trees, shrubs, and plants for your Denver landscaping needs. The Denver area can experience a myriad of storms throughout the entire year, rain or snow. By installing retaining walls, you are actually helping prevent flooding in your yard, as well as your neighborhood. These walls are easy to care for too, if installed properly. By the way, if you go through Water Solutions Company, you can be sure they will be! If you know that rain is coming, be sure to check the pipes so that they aren’t clogged. Retaining walls will also improve water drainage throughout your yard. Utilize retaining walls to make your space more functional and fun for your family. You can use them to define entertainment areas highlighting your outdoor kitchen or firepit. Add seating for your guests by turning the retaining walls into seats. By doing this, you’ll create more space for everyone to lounge around and enjoy the atmosphere. 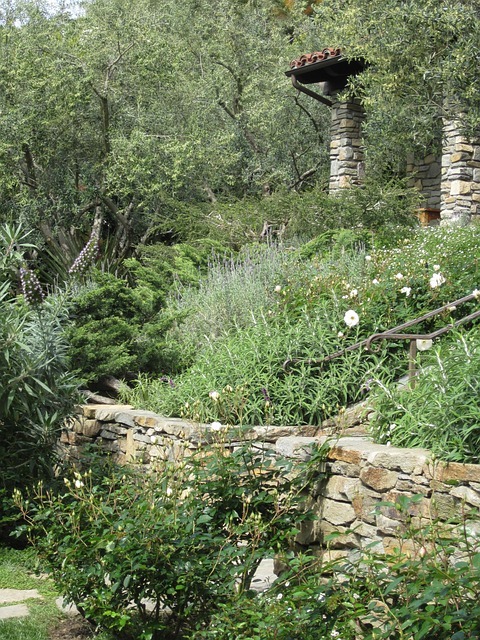 Feature your favorite plants by using the space created and defined by your retaining walls. To make everything look seamless, be sure to match your paving stones with the ones you’ve already used in other areas in your yard. If you can’t find the exact match, don’t worry, you can always use ones that are similar in tone. There are so many more benefits of retaining walls that are additional to this list. At Water Solutions Company, we can discuss what your landscape would look like with a retaining wall, and professionally install it for you. We want our customers to be 100% happy so we keep in mind your design tastes when installing. You can trust that we will provide quality service and top-notch materials. Give us a call today for a free estimate in the Denver area!